I needed to write a very short C# program to access a Sybase ASE database and extract some information. First had to download the appropriate version of ASE. It contains a directory called \archives\odbc. There is a setup.exe. Just run it. There is no need to add a data source to access ASE from an ODBC connection using C#. Just went there to check whether the driver was properly installed. If you omit the db=… part, you’ll just land in the master database. With this connection, you can then execute statements. This entry was posted in CSharp, ODBC, Sybase. Bookmark the permalink. Myself Prasad from Bangalore, I am basically from java background. .Net(C#) and Sybase is very new for me. I need to write a c# code to connect to Sybase db and pull some data. Thank you very much for tour post, but i did not get any information about the ASE driver required for the DB connection. 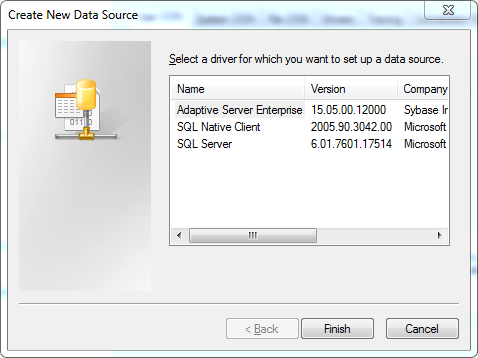 1) From where i can download the Sybase ASE ODBC driver for windows (is driver is free)? 2) In your post you say “First had to download the appropriate version of ASE”, are you talking about driver or some thing else? I need only the client related stuffs, DB is already installed in a remote system. My program need to connect from client windows box to remote DB. quick response is very much appreciated. Myself Prasad from Bangalore, India. Thank you very much for the post. I am from Java background and very much new to c# and Sybase ASE. Can you please let me know from where I can download ASE (Sybase ASE ODBC driver for windows)? I am trying to connect to remote Sybase DB and pull some data from my windows box. 1) is Sybase ASE ODBC driver for windows free? 2) is there any dll for drivers in c# as we get JAR’s in Java? Quick response very much appreciated. This is in continuation with my previous post. When I extracted the zip, there is no any “\odbc” folder inside “\archives”, as you have explained in the beginning of the post. I have a driver available called “Contabil” and the connection test works fine. Can anybody help me in finding out the reason for this exception..? And tjen i tried delete driver and use dsn , and it worked!